Willowy ALDON WILKIE, 30, southpaws ‘em across the plate. Aldon was shipped to the Acorns by the Pittsburgh Pirates early this season. 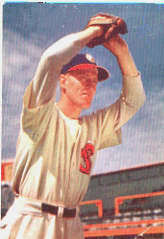 He was included in the deal that sent Wally Westlake up to the Pirates. Aldon is a 175-pounder, stands 5' 1l". Brown-haired and blue-eyed "Duke" Wilkie was born in Saskatchewan, Canada, in 1915 of Scotch-Norwegian descent. In high school, "Duke" won letters in ice hockey, baseball, basketball, and football, and started his professional baseball career in 1937. In his first game he pitched a shutout for 7 frames for Tacoma against Vancouver. In 1941 he went to Pittsburgh to play with the Pirates in the National League. He throws and bats left.